Wisconsin hosts many of the finest capitals of the world. Waunaukee is the only Wanaukee in the world. Mercer is the loon capital of the world. Racine is the kringle capital of the word. Milwaukee is the beer capital of the world. Boulder Junction, Stockbridge, and Presque Isle? The musky, sturgeon, and walleye capitals of the world. Bonus points if you can guess what Park Falls, Wisconsin claims as its capital of the world. Ruffed grouse would be the answer. And if you're looking for reasons why Park Falls might hold so many grouse, look no further than the elegant aspen tree. Characteristic of the ruffed grouse is its iconic drumming, where breeding males display for nearby females. Males choose to drum in young and regenerating stands of aspen. They especially love trees aged 6-15 years, with an open understory, likely better for displaying purposes. Aspen, when cut, readily resprouts, often sending off thousands of shoots from its complex root system. Grouse prefer areas with about 10,000 woody stems per acre, a massive clone of aspen! It may seem, then, that grouse need clearcut areas of regenerating aspen, but they prefer a more complicated arrangement than a simple clearcut. As a non-migratory bird, grouse need enough resources to overwinter in a cold climate. Unlike blue jays which cache acorns, or woodpeckers which dine on bug buffets in rotting trees, grouse rely on a largely vegetarian diet of twigs, leaves, fruits, acorns, and buds. Thus, in order to overwinter successfully, grouse need access to mature trees which provide male flower buds. Small tree harvests of about five acres within a forest matrix yield excellent grouse habitat, according to research conducted in Wisconsin. Approximately three mature trees per acre in a clearcut can provide enough food resources for overwintering grouse. The population dynamics of ruffed grouse obviously depend upon their habitat and food source, but there are higher effects concerning the grouse. Aspen is a short-lived species and cannot reproduce in its own shade, thus becoming quickly replaced by other tree species. The forest then shifts from early successional and young aspen sprouts to a less dense forest filled with larger diameter trees. While this situation may benefit many forest species like black-throated green warblers or pine martens, it is detrimental to the ruffed grouse because they need the dense cover of thousands of aspen sprouts to hide from predators. This forest succession has been occurring in northern Wisconsin for many decades, and grouse habitat and populations have decreased as Wisconsin forests have aged. Predators also influence population numbers. 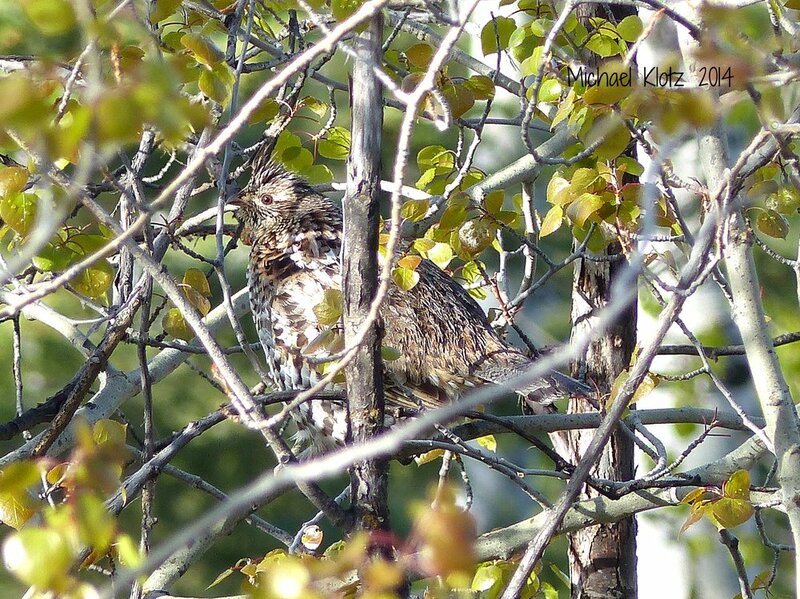 Goshawks and great horned owls will prey on ruffed grouse in lean snowshoe hare years, and these predators contribute to a cyclical decline in the grouse population. That cyclic nature of ruffed grouse populations is an interesting phenomenon. Due to DNR surveys conducted by wildlife professionals and volunteers, Wisconsin has grouse survey numbers for every year since 1964. You can find that information and the Wisconsin Department of Natural Resource's most recent report here. According to these drumming surveys, populations spike every ten years or so, almost always in a year ending in 9, 0, or 1. According to statewide numbers from this survey, 2017 saw an increasing population, setting the stage for a climb to a peak in 2019, 2020, or 2021. However, 2018's survey found a rather sharp decline on these drumming routes. As of yet, it's unclear what caused this decline. Today, ruffed grouse can be found in most of Wisconsin with the exception of the southeastern portion of the state. Faville Grove Sanctuary lacks ruffed grouse but they did historically occur here. Art Hawkins, a graduate student of Aldo Leopold, published “A Wildlife History of Favile Grove” in 1940 and according to his research and interviews with the previous generation, ruffed grouse were common in 1838. By the winter of 1936-37 the last “wandering” ruffed grouse was seen leaving Faville Grove, not to be seen again.